Various recent reports forecast that the global crude refining capacity will witness strong growth in the next five years. China, Southeast Asia, Latin America and the Middle East will lead the refinery growth. The most conservative report predicts a 9.4 mb/d addition in global capacity by 2020, whereas the most aggressive report expects an addition of 25 to 28 mb/d in the next five years. The purpose of this blog is to outline the SAP vision (from author’s perspective) for the digital energy revolution and how SAP integrated industry solution can empower Greenfield refineries throughout their journey from design through build and ultimately during operation. 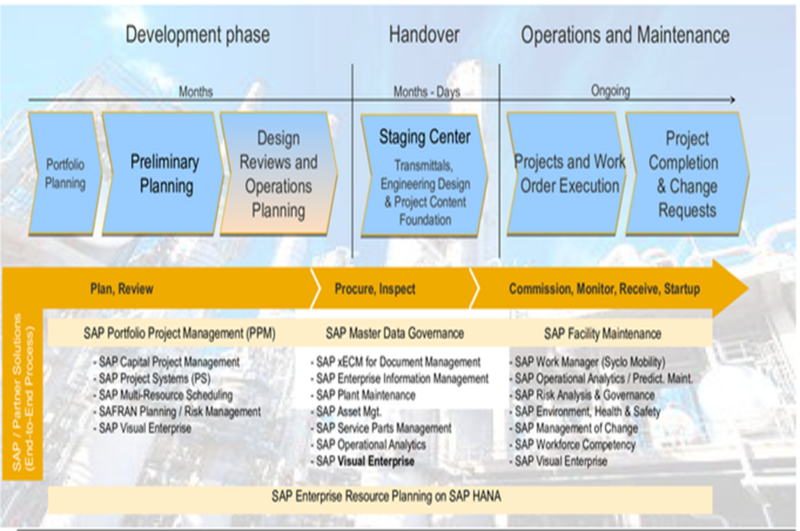 The way this blog is outlined is to first provide explanation of SAP’s vision for Digital Oil and Gas Companies, then highlights what process engineering leaders envision for refineries of the future, followed by the Greenfield refinery context from an SAP perspective and how SAP is perfectly positioned to support our customers throughout their design, build and operate journey. The final sections of the blog will outline the bases for taking the right decision for business solutions selection comparing best of breed to integrated approach, a high level sample architecture and a conclusion. Although this write up is intended for refineries, the Greenfield value realization is applicable for petrochemicals, process manufacturing as well as other asset intensive industries. During periods of extreme price volatility, oil and gas companies must become resilient by maximizing capital and operational efficiency using digital technologies, automating tasks, remotely monitoring assets, and more. It will be these digitally-enabled companies that are most able to diversify their energy portfolios in order to maintain and grow market share. True industry leaders will go even further, seeking out new ways to create value for customers by innovating new energy services. To deliver these services, they will need to shift away from traditional, vertically-integrated business models dependent on control of resources and assets – and embrace “asset-less”, collaborative, networked business models, processes, and ways of working. Digitalization will make this possible. Companies can connect business processes and join together these connected processes across the value chain through a digital network. These digitally-integrated energy companies will specialize and differentiate through execution excellence. The below diagram illustrates what is at the heart of a digital energy network. The idea is very simple – bringing together transactions and analytics on the same platform – but it took years to make it a reality. Uniting structured data (such as finance data) and untrusted data (such as text, video, and voice) will change the way energy companies plan, scale, and innovate. The innovation of in-memory computing started as a concept and was brought to life with the release of the SAP HANA technology platform. While SAP HANA is a relatively young technology by commercial standards, rapid adoption by oil and gas companies shows its massive potential value for the industry and digital businesses. 1. Leverage big data from meters, sensors, weather, social media, and geospatial systems. Analyzing all data signals together results in bigger insights and optimal recommendations, which can be instantly acted upon in transactional systems via human and machine-to-machine interfaces. 2. Extend business processes to interoperate with business partners in near real-time speeds using advanced, cloud-based business networks. 3. Modernize business processes from finance, supply chain, and enterprise asset management to meter-to- cash – all in real time without the need for data replication or batch programs. These capabilities create infinite new ways of optimizing business, driving business digitization, simplifying everything, reducing costs, and gaining the agility needed to succeed in today’s fast-changing world. Advanced, in-memory computing puts an end to running your business in batch mode and eliminates complex workarounds for production, processing, distribution, and retail of crude oil and products. Real-time optimization of business changes will have huge implications for how we work, do business, and organize. Every employee can access real business insights using simulation and predictive tools – insights that drive smarter decisions, improve reliability, and reduce outages. To thrive in the digital economy, energy companies need the ability to rapidly enter new markets, acquire and onboard new utility business models, and reflect organizational changes in a tenth of the time required with current systems. Accessing solutions to run your core business has to be simple. Energy companies now have the choice to deploy in house or in the cloud. In-memory computing also has a significant impact on TCO and it will free up funds for infrastructure investment. A quality user experience is vital to helping people accept digital change. It drives adoption, user engagement, and the productivity of people. 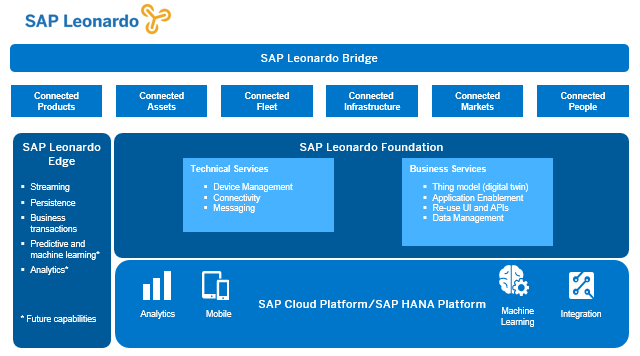 With IoT platform (SAP Leonardo), organizations can now take embedded device data, analyze this data into information in real time, and apply this information across the value chain to drive business insights and create new business models. Next-generation business processes will span multiple pillars to drive efficiency internally or across the business network, connect to devices, and enhance the Omni channel customer experience. Imagine that sensor data is continuously collected and analyzed in real time to measure and monitor asset status and health. This information is also fed into advanced analytics models that can predict impending asset failures early – in time for maintenance staff proactively take measures to avoid damages and outages. To determine proactive measures, the system needs to identify potential root causes for an expected failure and then recommend best actions – for example, this may involve ordering the right spare parts, assigning the right experts, and devising a cost-effective schedule. The digital work order dispatches the service crew and provides additional geospatial and device information to ensure that the right activities are conducted at the right time by qualified people, and with the right spare parts and tools. Every outage and failure that can be prevented or proactively managed minimizes cost and maximizes asset availability and increases customer satisfaction. With its Digital Core, industry focus as well as Information Technology/Operation Technology (IT/OT) convergence framework, SAP is very well positioned to address the three primary operational and business goals to run the refinery of the Future. Sharing of Intelligence: The hydrocarbon value chain is at the heart of the downstream business, and today’s fragmented and often outdated IT landscape prevents oil and gas companies from unlocking all of the available value. SAP Connected Hydrocarbons Logistics unlocks this value by better managing changes in supply, demand and commodity prices. Connected Hydrocarbons deliver two key digital capabilities our customers are demanding: a real-time view of all their product inventories, and the ability to predict asset failures and prescribe their best sequence of repair. SAP co-innovate with oil and gas major players developing uses cases around use of drones and internet of things around assets inspection/surveillance. 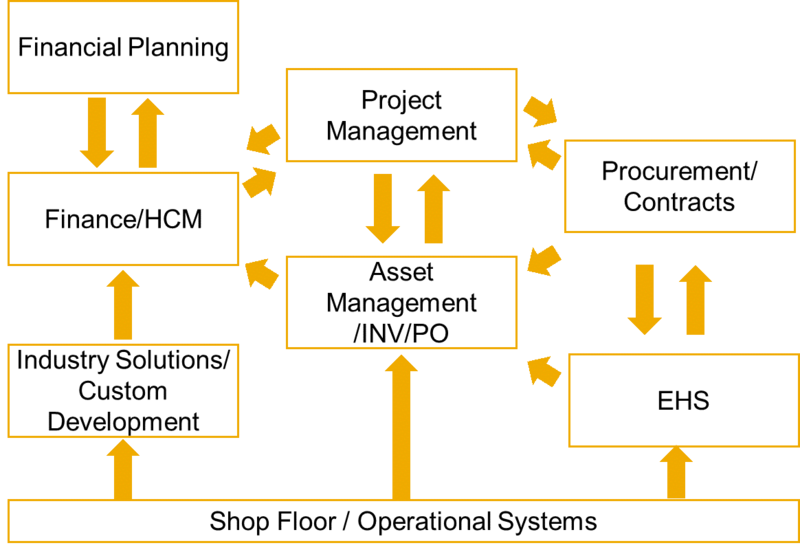 In the Greenfield context, customers are faced with unique challenges/opportunities that SAP is best equipped to fully and efficiently address through teaming up with Greenfield refinery customers along the entire journey from project planning through design and execution/build to handover, commissioning and operation. The following section highlights major Greenfield challenges/opportunities. 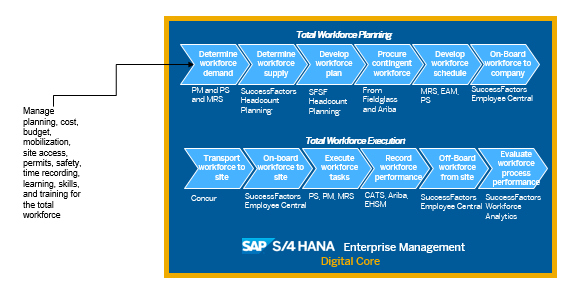 From the day a new company has just been incorporated to manage a new refinery or the new refinery is just an initiative/idea, S4/HANA is the perfect fit to manage the core activities that include finance, procurement and project portfolio management. 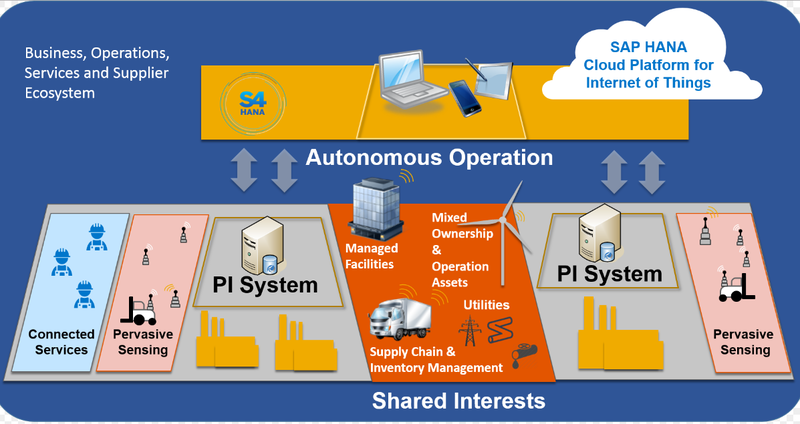 S4/HANA simplified technology stack brings in very appealing TCO with an unprecedented scalability to cover all business activities throughout the refinery build and operate journey. Equipment manufacturers leave behind enormous amount of information in all sorts of formats. Most of this data are very crucial in building a resilient master data repository. Acquiring engineering data and equipment manufacturer handover is a typical requirement for a Greenfield refinery. 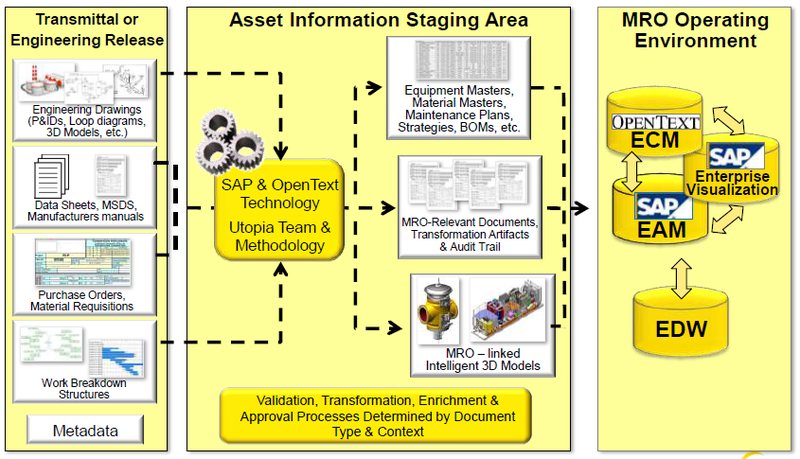 SAP in collaboration with our partners, has greatly simplified the challenge of asset master data management by adding a suite of pre-configured master data governance (MDG) data objects for enterprise asset management. These objects are built upon the SAP Master Data Governance platform. The enterprise asset management extension includes preconfigured data structures, industry templates, best practices, workflows and user interfaces for EAM data objects. Maintenance managers working in process industries or in EPC companies are always under enormous pressure to ensure their plant’s equipment and machinery is working at an optimum level, which requires timely maintenance. But due to disparate systems, or missing or incomplete operators’ manuals, drawings and other information, maintenance can be a difficult challenge. SAP 3D Visual Enterprise supports over 100 3D and 2D file formats, including Autodesk and Bentley formats. This allows our customers to amplify the value of (Building Information Management) BIM tools such as Intergraph SmartPlant 3D, Aveva PDMS, and others by re-purposing BIM data into a lightweight 3D format with full topology and attribution. The SAP lightweight 3D model can be enriched with EAM master data. 40+ years of industry experience are accumulated in industry best practices. SAP and SAP Partners utilize industry best practices and template based implementations to reduce risk and shorten implementation. Today’s modern systems include additional features not found in legacy systems, such as embedded advanced process control, statistical monitoring, smart device monitoring, asset health monitoring and more. Field instruments that are equipped with smart diagnostics can alert key maintenance, operations or safety personnel about asset problems in real time before they fail or cause abnormal operation. The diagnostics can identify the root cause of the troubled asset, so maintenance can effectively correct the problem. This same root cause predictive diagnostic capability can be utilized to identify and plan for a smarter turnaround by repairing only the assets requiring work. SAP enables Greenfield digital refineries to utilize state of the art software technologies combined with industry best business practices to efficiently manage both core and innovative business processes. Energy leaders are investing in digital capabilities that support their strategy and will enable them to participate in a digital energy network. This network will give all participants a platform for driving efficiency, accelerating energy innovation, and developing new business models. ROI drives this significant phase of the transition to digital. It’s not about any single one of the five pillars in isolation, but rather how they all interconnect to achieve business outcomes. At SAP, we use design thinking as our key method during the reimagining phase. Design thinking helps you define what can be converted from your business strategy and customer needs into customer value and market opportunities. Smart operations and maintenance of gas plants, refineries, and terminals, and other assets is essential for cost efficient, compliant, and safe energy production, particularly in complex and hazardous production environments. 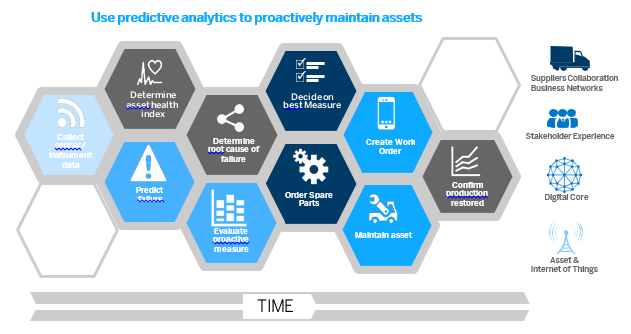 Using asset information and maintenance solutions together with integrated predictive analytics, companies can use sensor data to proactively monitor asset health. This kind of smart, digitally integrated asset management can be extended through energy networks to support automated allocation of spare parts, work, and logistics services. And by combining asset, planning, and financial data, they can analyze it and make decisions based on a holistic understanding of the impact of maintenance decisions. Digital energy companies will improve machine-to-machine collaboration and provide simulations – for example, of asset repair procedures. And by delegating business processes from people to machines, companies will need fewer, yet higher skilled, workers who can orchestrate complex systems. Digital energy companies will require effective and adaptive digital communication both within their organization and between their assets, workforce, customers, service providers, and all other stakeholders. Real-time digital information on the right devices will be a critical factor for the digitally-enabled worker to build and run the digital refinery of the future. Greenfield refineries would potentially have to choose between the best of breed business systems and integrated business system options. This section highlight the differences between the two approaches. Under different conditions and for different reasons -mostly around being historically comfortable with specific solutions, new refinery owners will adopt the best of breed approach. That is, each department or function will adopt the solution that they are comfortable with. In such scenario each department will potentially be happy with what they have however on the strategic level such approach generates lots of technology and logistics challenges. Efforts are poured into maintaining integration across various solutions instead of continuous process enhancements and innovations. Refineries become considerably less flexible in responding to industry and market dynamics in such context. With no real time integration between Production Management, Asset Management and Financial Management, real-time product/unit based margin analysis is almost impossible or significantly inaccurate. Same applies to cross departmental reporting, budget analysis, forecasting and simulations. Refineries taking this approach usually ends up facing considerable data integrity issues resulting from having multiple copies of data maintained in several solutions/databases. For every new requirement and in order to address operational pains, owners and operators develop additional solutions (silos) that would potentially replicate considerable part of data and add more integration points that in turn escalate complexity and make scalability and flexibility much more challenging. Imagine you have all your operational data maintained within an ultra-swift digital core. You don’t have to worry about integrating your asset operational data to your finance system or investing lots of time consolidating crude and products inventory in batch mode to your financial system. Inquires like asset life time cost, products margin analysis, budget control, forecasting and simulations become native functionality and in real time. 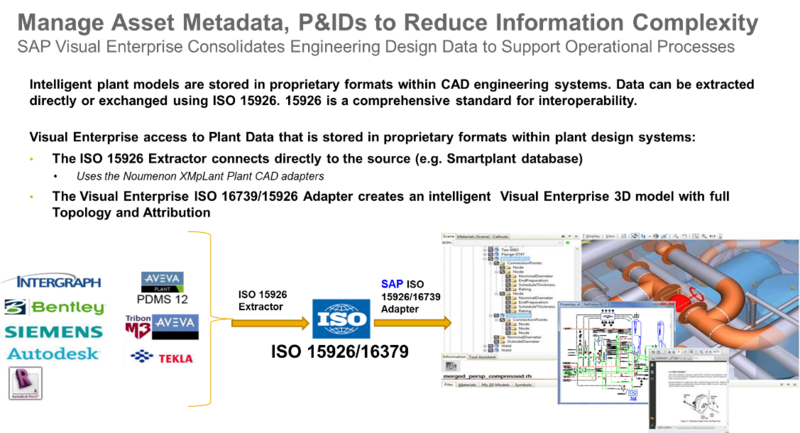 Data integrity issues are significantly reduced especially if the proper engineering data handover was carried out using the SAP approach outlined in this blog. The integrated digital core approach gives refineries much better scalability and flexibility in responding to industry and market challenges. As an example, we have recently co-innovated -with a refinery customer, a solution to reduce outages due to corrosion in crude processing units. 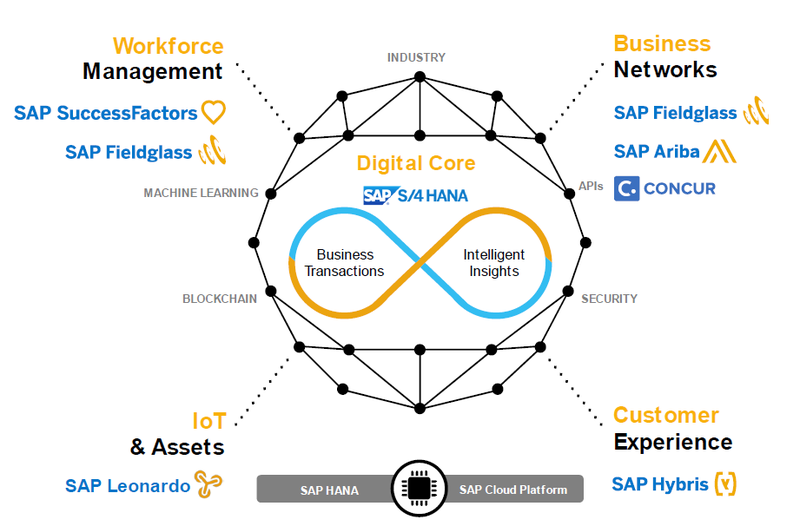 The solution was built around the high processing speed of the In-memory digital core, IT-OT connectivity through SAP Leonardo together with predictive and machine learning capabilities of the digital core and self service analytics. Through a POC customer managed to find a correlation between the levels of chemicals need to be injected to avoid corrosion and the conditions/substances that are potentially causing it. This allowed customer to maintain the right conditions to minimize corrosion which translates into longer unit life time and higher refinery throughput. SAP underpins the digital refinery of the future with the Digital core, Business Networks, Digital Supply Chain and the Internet of Things. SAP will bring the simplification, innovation, and acceleration required to support the Greenfield refinery journey. In the digital economy, simplification and business innovation matters more than ever. 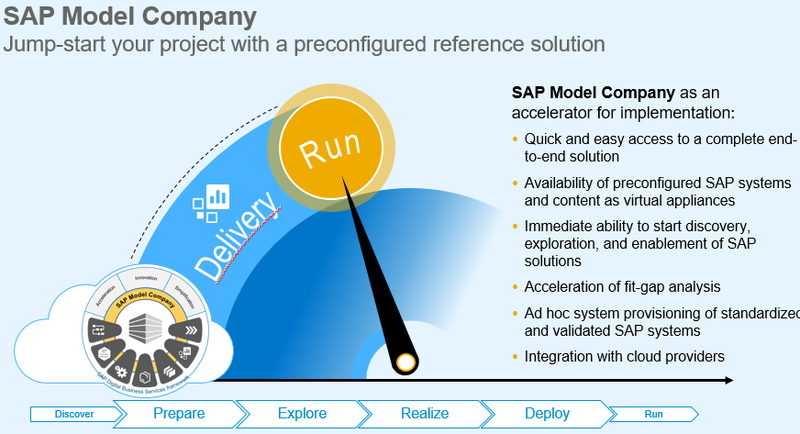 SAP has a broad range of services to cover the end-to-end digital refinery journey, ranging from advising on a digital innovation roadmap and plan to implement with proven best practices to the ability to run across all deployment models and ultimately optimize for continuous innovation across your digital journey. We at SAP believe that our digital core integrated end to end industry specific offering is the perfect choice for Greenfield as well as Brownfield refineries who are after acceptable TCO and end to end real time actionable business insights. Oil and Gas companies adopting an integrated system with a digital core are destined to realize tremendous potential benefits on four frontiers, Strategy Enablement, Business Benefits, Risk Management as well as IT Benefits and TCO. The vision was to gain complete visibility into operations, making the business more flexible, agile, and responsive. To turn this vision into reality, SASREF and SAP established the Tamkeen program. Through Tamkeen, the company rejuvenated its IT infrastructure and achieved many industry-leading innovations like visibility into unit-wise product costing based on actual material flows and a machine vibration management solution enabled by integration between IT and operational technology. The result is that SASREF can now respond to rapidly changing industry dynamics to improve its profitability and sharpen its competitive edge. Oil Refining Capacity Set To Surge, But Can It Boost Oil Prices?